You’ve got ideas for new iPhone apps. Cool ideas. Maybe even amazing ideas. And you’re ready to turn them into a reality. Except… going from idea to building a fully functional app that someone other than your mother might actually download requires skills - like coding and UI design. And you have to do it all in programming languages that Apple changes faster than the last version of the iPhone. Which means even if you do know your Python from your C++, successfully developing an iPhone app can be a challenging and frustrating experience. I’ve created the Super Easy iPhone App course series to help you make your first app in 30 days - no matter your coding experience. After 3 years of teaching over 35,000 people the ins and outs of iPhone app development, I’ve learned a thing or two about helping people successfully create their own apps. The lessons in each course have been designed with the beginner in mind. This means that I teach using simplified explanations and everyday language. You won’t get lost in a sea of tech jargon. Each video lesson takes anywhere from 4 to 15 minutes to watch. I’ve kept them short but highly actionable - which means you’ll be able to accomplish a lot in a short amount of time. Not only will you get email support from me to answer questions and help you troubleshoot your app but you’ll have access to an online forum where students can post code solutions, screenshots, videos, and see job postings. While you’ll always get source code to help you work through a lesson, my goal is to teach you how to develop an app on your own. You’ll have challenges to apply what you’ve learned and build on it. With Super Easy iPhone Apps, you’ll always have access to lessons that reflect the most recent versions of the programming languages you’ll be using. … and you’ll get direction on where to look and how to think when approaching user interface (UI) design and code all within the easy to follow video tutorials. The entire course has been divided into 5 modules - each with over-the-shoulder video tutorials that walk you through the app development process step by step. Take your first step into the world of iPhone apps. 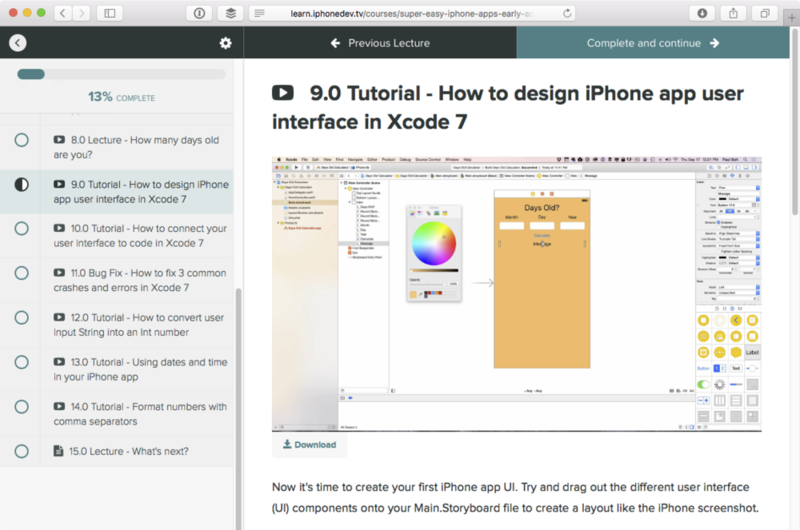 You’ll begin with the basics of using Xcode 7, UI design, and Swift 2 code for making your first app. Design beautiful iPhone app UI. You’ll learn to build different screens and animate them using Auto Layout, animation, and physics. Download data from the web to power your iPhone app. You’ll find out exactly how easy it is to work with Swift, web servers, and JSON web data. Display multimedia content on your app. You’ll learn the ins and outs of using incredible typography and design to adapt Apple’s flexible foundation to any kind of app you develop. 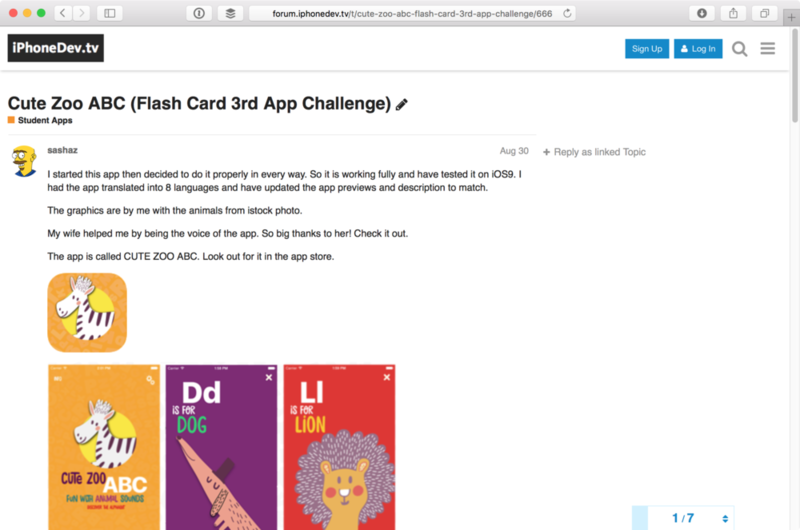 Add brand new features and polish to your own app quickly and efficiently. You’ll get ideas and inspiration on how your apps can leverage location, touch (3D Touch), tactile animations, maps, iOS 9 features, and more. The iPhoneDev.tv Forum - It's the place where you can post code solutions, screenshots, videos, and see job postings. Email Support – I answer your questions, look at errors that might be roadblocks, and suggest helpful resources. Live Q&A Sessions - Get direct answers to your most pressing questions as soon as new course material becomes available. Once you join the course, you’ll have immediate access to over 24 easy to follow videos with 4+ hours of content you can start now. As new content and modules are added every two weeks, you’ll get access to regular Q&A sessions with me to go over any questions or concerns about the material. Plus, you’ll get added to the members only forum as soon as you enroll. You can jump into conversations with other students and me whenever you like. In addition to everything included in the course, you’ll join a mastermind community dedicated to helping you learn faster and get immediate feedback. ✔ Exclusive interviews with developers, marketers, and more . . .
To keep the mastermind small enough so everyone gets the support they need, only 20 spots are available.